2013 was the year of the domestic bull, with all other asset classes falling short and leading investors to wonder why they should bother allocating money to underperforming asset classes such as bonds, international stocks, and emerging markets. While it is true that an entirely domestic equity portfolio would have been a great call last year, hindsight is 20/20, and a similar allocation this year becomes even more risky as valuations creep higher. Now is the time to employ a disciplined, well-diversified, risk-budgeted portfolio to protect on the downside. Take a look at the chart below that I recreated from a piece done by Pension Partners. Using the Shiller database that I am so fond of, we can see that the domestic equity market, represented by the S&P 500, is now reaching five year returns close to 150%. 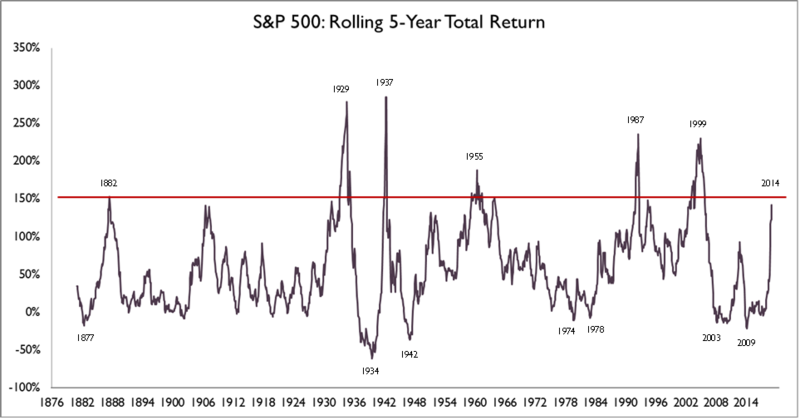 This level of return has only been reached six other times in history and these peaks are followed by dramatic losses ranging from -21% to -86%. You can also see, the market has at times continued to surge past this 150% return level and twice has reached 5- year returns just under 300%. Take a look at the dates listed and you will be able to identify major events in U.S. market history, such as the Great Depression and the Tech Bubble. This paints a pretty gloomy picture. Is it possible that this time will be different, or that the S&P could continue to realize gains up to, or past, levels seen in 1937? Of course it is, and this would leave plenty of room for further growth. However, history and probabilities are a powerful story. I look at this chart and see that while growth may continue a while longer, this is a warning to begin to par expectations from domestic equities and to reallocate undiversified portfolios with heavy bets on the United States. Good news, our portfolio management team has already done this! We have trimmed our domestic outlooks for the next twelve months and have portfolios invested in numerous asset classes. Our portfolios are overweight in alternatives, international, and emerging market equities, which should provide diversification benefits if the market begins to sour. In addition, we are monitoring portfolios to their proprietary risk-budget, keeping risk constant and monitoring over 250 ETF data points every day to make sure we are investing in the best opportunities. 2013 may have been the year of the domestic portfolio, but I say that 2014 is going to be the year of the diversified portfolio!